Dixon Lake is a jewel in the hills above Escondido. 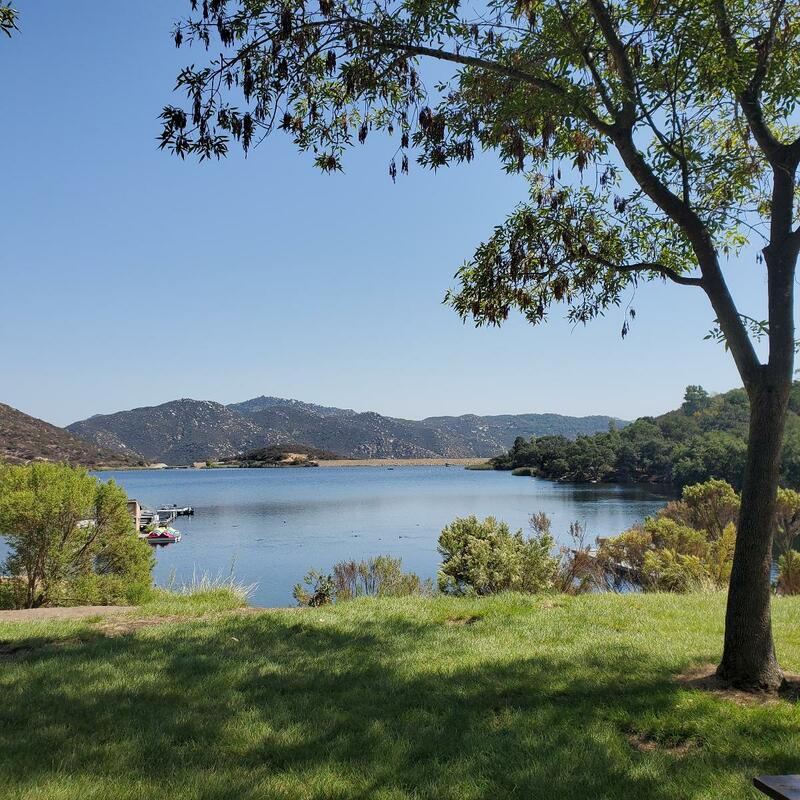 Campsites at Dixon Lake range from secluded and shaded, to wide open views of the lake, mountains or city lights. The campground is open year-round, with 24 hour accessibility. Roads and trails from the Dixon Lake campground provide walking access to great trout, catfish and bass spots along the shore. There are boats available for rent at the Park's concessions as well. Never leave food out on tables when you leave your campsite. Put all food in your car or in the food storage locker provided on the campsite. Do not entice the raccoons with handouts. This only makes them expect to be fed, which leads to assertive behavior when they're ignored. Make sure the lid to your trash can is fully secured. 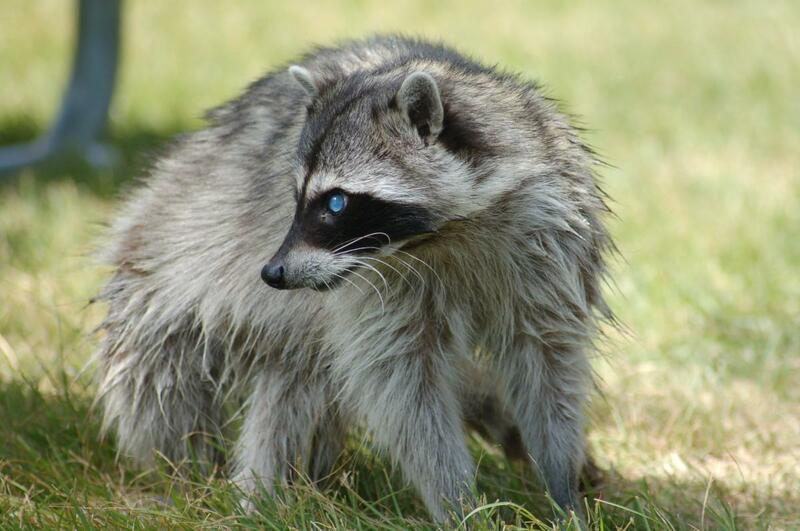 You may notice raccoon tracks on our trash can lids, because they can climb easily. However, they have not been able to open lids that are properly secured. Don't leave extra bags of trash next to the trash cans. 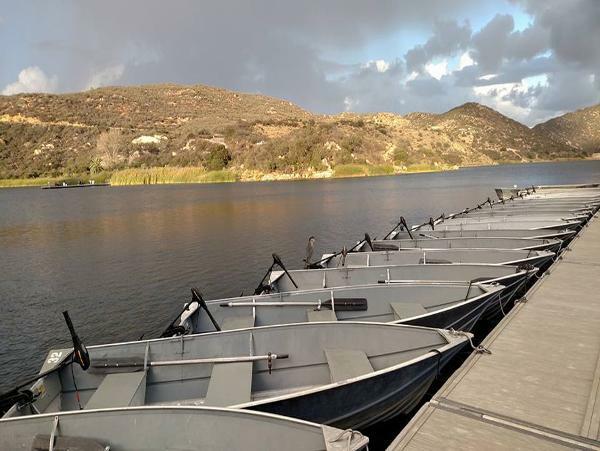 If you have more trash than will fit in a trash can, notify a member of the Dixon Lake staff. Someone will stop by and properly dispose of the excess trash. Finally, remember that raccoons and pets don't mix, and pet food left out on your campsite will only invite trouble. All dogs must be maintained on a leash of no more than 6' at all times. The leash must be held or controlled by the person handling the dog. All persons bringing dogs to Dixon Lake shall be responsible for immediately cleaning up after the dog. Waste disposal bags shall be placed in a trash can. All dogs brought to Dixon Lake must have a current license issued by the animal regulation agency where the dog owner resides. Proof of licensure or current vaccination record may be required at any time. Dogs are not allowed within 50' of the shoreline, nor are they allowed in any boats on the lake. Service animals are exempt from this requirement. Dogs shall not be left unattended in any camper, motor home, tent, vehicle or other camping equipment at any time. Animals in distress will be released from unattended vehicles by the appropriate enforcement agency. Continually barking dogs in the campground may result in loss of camping privileges for the owner/handler. Dogs are not to be tied to any trees, shrubs, posts, fences or any other items at any time. No more than three (3) dogs will be allowed in any campsite at any time. Visitors to campsites must register any dogs at the concession stand prior to visiting any campsite. Visiting dogs are counted in the total number of dogs on the site. No dogs are allowed in any buildings at Dixon Lake, including restrooms, the rental cabin or the Ranger station. Service animals are exempt from this exclusion. No person shall bring a dog or other domestic animal into a recreation area except where signs are present indicating that dogs or other domestic animals are allowed, subject to the conditions and restrictions posted on such signs. Customer Service hours are Monday through Friday, 7 AM - 4 PM. Please call (760) 839-4045 for assistance. Trout season continues to be successful. We'll stock with Rainbow Trout from Calaveras Trout Farm again on Wednesday, February 13. The stock truck usually arrives in the afternoon, but you're welcome to check out the lake anytime and drown some worms! Disabled Cabin Rental increases from $40 to $50 per night. The four night maximum stay within 90 days remains in place. Visitors with dogs will now be charged $1 per dog, per night. The three dog per campsite limit remains in place. Off season rates for both deluxe and standard campsites have been eliminated. Rates will remain at $35 per night for a deluxe campsite (water, electric and sewer) and $25 per night for a standard campsite. The 14 day stay limit within a 30 day period will be year round. Please note that private boats or other watercraft are NOT allowed at any time. Fishing permits are required during all fishing hours and must be purchased at the concession stand prior to fishing. Park Rangers cannot sell permits on shore or at the boat dock. Bait and other supplies are also available at the concession stand. Please see a Park Ranger on duty for full details on fishing rules. Remember, no alcohol is allowed on shore or in boats. Smoking is not allowed anywhere in the park. Violations of these rules will result in ejection from the lake. Please contact the Dixon Lake Reservation Line at (760) 839-4045 with any questions, or to make a reservation by phone. See the Dixon Lake page on the City's website (www.escondido.org) for more information.